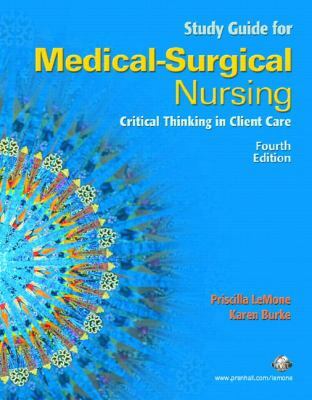 Student Study Guide Medical Surgical Nursing: Critical Thinking in Client Care, Single Vol. This study guide helps students succeed in medical-surgical nursing courses with lecture outlines, focused study tips, case studies, and NCLEX-RN® review questions.Baumer, Christina is the author of 'Student Study Guide Medical Surgical Nursing: Critical Thinking in Client Care, Single Vol. ', published 2007 under ISBN 9780131985704 and ISBN 0131985701.